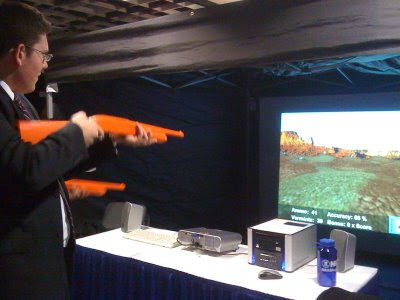 Friday was Day 2 of CPAC. I wasn't feeling well so I only made it over there around 4pm - just enough time to stop by the job fair, take pics in the exhibition hall, and check out the happy hours! 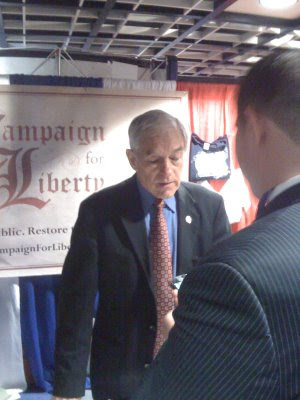 I saw a big line of people in the middle of an exhibit aisle and I soon found out they were all there hoping to get books signed by Rep. Ron Paul. Yes, there are many constituencies in the conservative coalition. 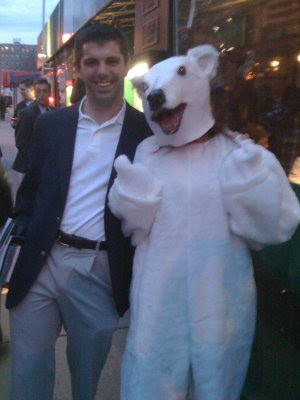 My friend Dave gets a picture with the CFACT polar bear who is protesting the myth of global warming while inviting people in for a happy hour! 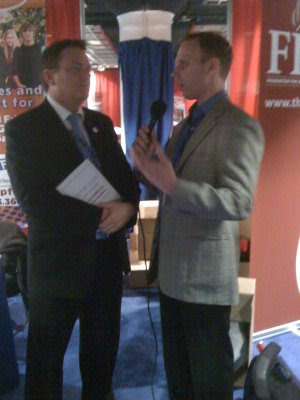 The guy on the right is leftist Max Blumenthal who crashes conservative conventions and events to antagonize participants, heavily edit it and put it on YouTube. Don't talk to him! Gov. 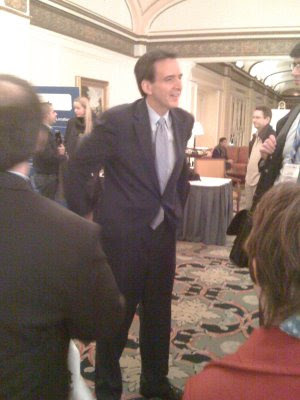 Tim Pawlenty (R-MN) stops to talk with our group before he headlines a reception sponsored by Rebuild the Party featuring cigars and scotch. 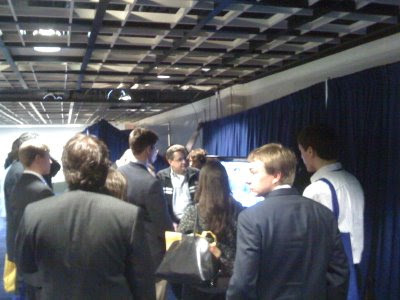 People gather round the monitors in the exhibition hall to see Mitt Romney who was speaking in the main ball room. 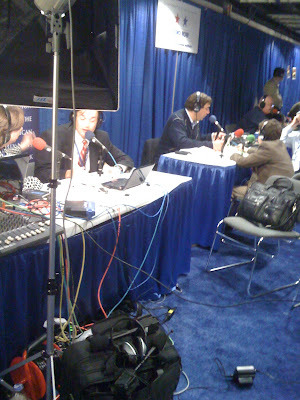 Radio Row - many conservative talk radio hosts set up shop to broadcast live at CPAC as well as interview the many interesting speakers and presenters. 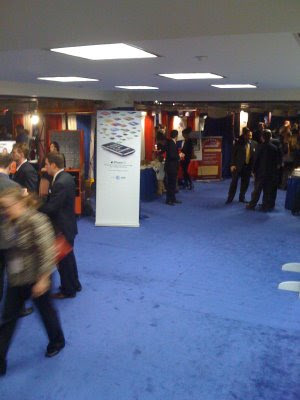 A view of the entrance of the exhibit hall - with a nice charging station for iPhones right there in the front. 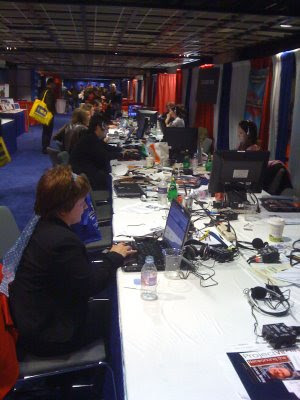 Bloggers Row, featuring Krystal of Crystal Clear Conservative updating her blog. Tomorrow: Rush Limbaugh and Reaganpalooza!!! Again, follow my twitter stream: @AlexaShrugged and you can watch the proceedings online at UStream sponsored by Townhall.